When first leaping into a new subject there’s often a bit of hesitation. This is natural as humans don’t often like to fail, so it’s tough to get started and pursue something on own our. Thankfully a new website Mybridge makes the process a whole lot easier. You can select any subject matter from development, design, or marketing to get a series of highly-voted learning resources. These could include videos or might be text-based tutorials – the point is to mitigate the hardship of searching online for quality educational materials. Beyond typical categories you’ll also find specific learning tracks. These range from AngularJS to Sketch 3 and even startup development. Given enough time & dedication you’ll be able to learn any number of skills with the help of these curated resources. Sort through trending submissions, highest-rated links, or even user-created collections. 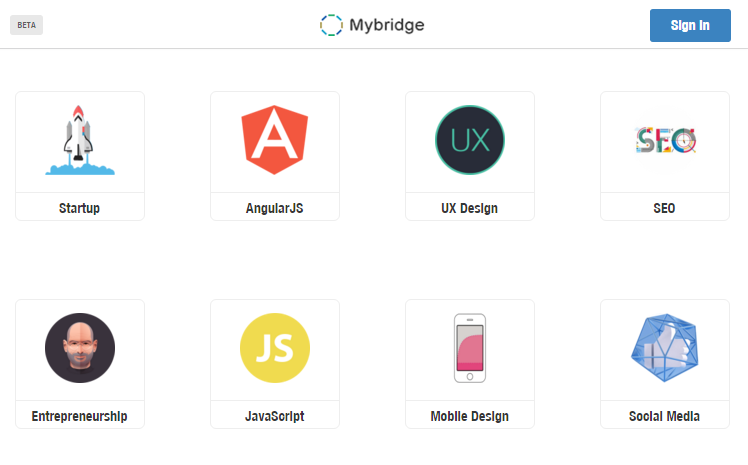 Mybridge seems to be the ultimate tool in self-learning for technologically-inclined people. The site does not require an account to browse, although you do get extra features like personal tracks & collections. Plus Mybridge is completely free so there’s no downside to getting started on the site.